Colleges have other options for cell phone alerts, of course. They could go off campus and hire a company specializing in text messaging. That’s what Rave Wireless and Mobile Campus are offering to universities. This alert solution costs a college about $10,000 a year. “It gives students unlimited text messaging plans,” added Mr. Rishi. He said the plan works with all cell phone carriers, email, and web mail. So if the student doesn’t have a cell phone, he can still receive an email alert. 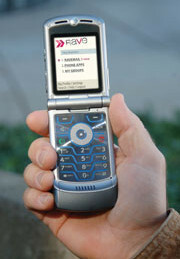 Rave also offers a full-blown cell phone solution called Rave Campus that is tied to a specific carrier. At Atlanta-based Mercer University, Rave Campus recently announced a tie-in with Sprint. “With this you get additional features like really reduced phone rates and other options,” said Mr. Rishi. And of course, the program includes the emergency text notification feature. “Rave Alert is designed to work with any cell phone. Rave Campus is designed around a (specific) phone model (and carrier),” he added. The company currently serves about 25 campuses, about half which use just Rave Alert and the other half Rave Campus. By the end of the year, Mr. Rishi said he expects to have 60 or 70 campuses in one or the other program. In fact, the decision to go with Rave, and its enhanced text messaging features, came in March, about a month before the Virginia Tech shooting. “There is certainly a safety component of Rave Wireless but we see a lot of value in some of the applications that Rave provides in building the community, enhancing student learning as well as the safety features,” added Mr. Belote. The phones are free to students and the $32.50 base plan includes unlimited text messaging, free nights and weekend calls and unlimited calling using Mercer’s Mobile Network, explains Mr. Belote. Full deployment is expected to take place this August, in time for fall enrollment. He said if a student decides to keep his existing phone, he can still sign up with the college to receive emergency or other types of text messaging alerts. Another option is Mobile Campus, Atlanta, GA. It offers free text messaging to university students in exchange for the students agreeing to receive advertisements a couple times a day. Jim Ryan, president and CEO for Mobile Campus, said the company gives university administrators a web-based interface to communicate with students. In a perfect world, that would be all that’s needed. But cell phones aren’t perfect. “The challenge is we don’t own the SMS infrastructure,” said Mr. Ryan. “All we can do is place the message out there for delivery. But (carrier) capacity and various other challenges will determine how long it will take to get the message to the individual,” he said. Text messages delivered around the country shouldn’t be a problem, “but when you’re delivering SMS in a given geography, when you try to send 30,000 messages through one cell site, that’s when you run into capacity (problems),” he added. That’s why he believes universities should concentrate on delivering “something that’s multi-modal–text messaging and email–so if one fails, the other works,” he said.